Store your files on a USB stick — a compact storage medium with fast data transfer which is very compatible and easy to use. Suitable for storing pictures, films, music and documents for example, and with a storage capacity of 32 or 128 GB you can decide how much you want to save on the USB flash drive. By storing data on the USB memory stick you free up space on your computer or mobile phone. USB 3.0 has extremely fast data transfer and some USB flash drives can be connected directly to your iPhone or iPad. 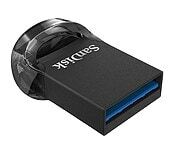 USB 3.0 for quick data transfer. Practical keyring eyelet.